Extreame Savings Item! 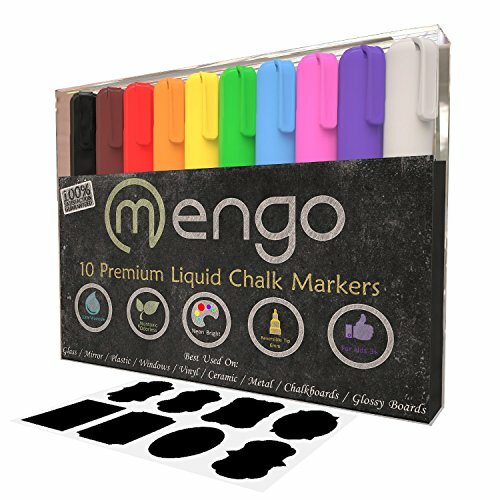 Save 46% on the Chalk Markers – Erasable Liquid Markers - Bright Neon Colors (10 Pack) Non-Toxic Liquid Pen Washable Markers for Kids of All Ages – Draw on Chalkboard, Windows, Glass, Paper & More + 8 Free Labels by Mengo at Designers Artists. MPN: MG267. Hurry! Limited time offer. Offer valid only while supplies last. LIQUID CHALK MARKERS: Super Bright washable markers with bright neon colors made from high quality, nontoxic materials. Ideal for boys or girls, of any age! These markers are odorless. Included with the liquid chalk markers are 8 free labels! WASHABLE: These chalk markers can be used to draw on any non-porous surface such as glass, mirror, plastic, windows, vinyl, ceramic, metal, chalkboards, glossy boards, etc. Always test the markers first, on a small area to ensure the liquid chalk markers erase. REVERSIBLE TIPS makes it easy to do both fine and bold work! Kids can have endless fun creating holiday, Birthday, 4th of July, Halloween, Christmas, Hanukah decorations and the more! The reversible tips allow your markers to turn into chisel markers and fine tip markers. These washable liquid chalk markers can also be used by restaurant and bar owners, teachers, kids, and adults! Gift these beautiful markers today! SAFE , NON-TOXIX: These liquid chalk markers were crafted with kids in mind. We made them specifically odorless, easy to clean, and non-toxic. These markers will become your child's favorite new activity! If you have any questions about this product by Mengo, contact us by completing and submitting the form below. If you are looking for a specif part number, please include it with your message.